Conestoga Supply & Heating is the areaï¿½s leading distributor of Rheem HVAC systems, as well as the most comprehensive supplier of hydronic equipment in the South Central Pennsylvania region. Conestoga Supply & Heating is located in the traditionally conservative Pennsylvania Dutch area of the state, but we are anything but conservative in our approach toward service and sales to our customers! Since joining the Hajoca team in 1997, we have concentrated on becoming a progressive partner to the contractors in Lancaster, Lebanon, and surrounding counties. We have done this by building an extensive inventory, by committing ourselves to the training of new industry technology, and by providing full-scale technical and design support. HVAC -- With the Rheem product line, providing temperate air is never a problem. Residential and Commercial systems are available for virtually any size job. HYDRONICS -- Boilers, boilers, boilers... We have them! Carrying the products of four boiler manufacturers enables us to put the exact system on the job every time. RADIANT HEATING SYSTEMS -- Whether itï¿½s keeping the familyï¿½s feet warm on a tiled bath or kitchen floor, maintaining an even temperature throughout your home, or melting the snow effortlessly from your paved driveway, we can make your life more comfortable with hot water radiant heat. AIR QUALITY CONTROL -- Breathe easier knowing that your air has been cleansed by one of the many systems available to suit your particular needs. WATER TREATMENT -- Protect your investment! Water conditioning and purification to protect your family, or to protect your plumbing/heating system, is readily available. Weï¿½ll even test your water! PLUMBING -- We can fill your plumbing needs, too. 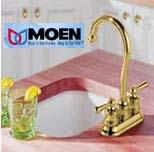 Conestogaï¿½s Lebanon location is a full service plumbing wholesaler. In addition to all of the HVAC systems and specialties handled throughout both locations, our Lebanon location carries a full range of fixtures, faucets, pumps, and other plumbing supplies. Click on the navigation bar for the location nearest you!